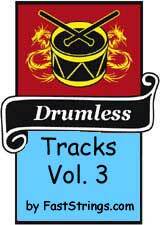 The 3rd volume of free drumless tracks by FastStrings.com. This set includes such bands (artists) as: Guns N Roses, Incubus, Iron Maiden, Jimi Hendrix, Kiss, Korn, Lamb of God, Linkin Park, Megadeth and many more. We proud to offer these great play-along songs for our fans. Use these tracks to enhance your playing skills or to just have fun. The 3rd volume includes almost 300 tracks in such styles as: rock, jazz, blues, metal, hard rock, punk. 300 Backing Tracks for Drummers to Practice and Perform. Play along, jam tracks, minus drums for free. How to download please read the FAQ page. Many Thanks to faststrings for these real drumless mp3.keep up the Goodwork! Como descargo canciones sin batería ? can someone explain how to get these tracks? thank you very much. Thank you again FastStrings. I’m your big FAN!!! Only in FastStrings drumless tracks mp3 high quality. thank you very much. FastStrings is the best site on the Internet. I would like to download the songs but cannot find the link !!!! thanks a lot from Vietnam!! !